Eefje "Sjokz" Depoortere has done a lot of jobs on her way to being one of the most recognizable faces in esports. She's worked on television as both a presenter and reporter, competed in beauty pageants and professional Unreal Tournament competitions, and is now the iconic host of the European League of Legends Championship Series. Sjokz joined theScore esports Podcast to discuss that journey, as well as Riot's decision to keep Worlds' English language broadcasters off-location until the finals, and her thoughts on the future of League of Legends. Riot's recent announcement that most of the English-language broadcast for the 2018 League of Legends World Championships in South Korea would be conducted from a studio in Los Angeles has proven controversial. Worlds is the crown jewel of League's competitive circuit and fans expect Riot to put as much money as possible into its production. But, as far as Sjokz is concerned, the shift towards remote broadcasting isn't necessarily a bad thing. "We used to broadcast the analyst desk from the L.A. studio for a long time and would only come on site for the finals," she told theScore esports. We had the AD in LA for many years before taking it with at events, and no one had any complaints. Now personally, I do feel at least commentators should be on location, BUT as said it is an experiment. "The fact of the matter is also that there has been so much investment in making [the LA studio] insanely equipped with... everything so that you can make the best possible show with the best possible graphics, the best possible AR and everything." Sjokz went on to say that while having talent on the ground can provide a feeling of authenticity, broadcasting remotely allows casters and analysts to utilize the kinds of resources that only a studio can provide. The goal, she added, is to put on the best show possible, whatever that might entail. "If the positivity of doing it and creating the best content in that studio outweighs having that [kind of authenticity]," she said, "then that's just a choice I think Riot has to make, and that's why they are doing it now." In terms of the future of League at large, Sjokz said that while it isn't likely that the will game continue to grow as quickly as it has previously, she's confident that LoL will continue to have an enduring presence. "You need to put in more than you used to," she said. "I think we have definitely left the time where everything was growing no matter what you did, and everyone was playing League and everyone was watching League because there was not that much else." But the face of the EU LCS does believe that the future of esports itself is bright. Even if League's popularity is starting to fade, it's only fading because other games are rising up to take its place at the top. "It's become harder to distinguish yourself," she said. "But, in a way, that's also a good thing. I take that in stride and I think that's a wonderful challenge to have... if League of Legends necessarily isn't growing as explosively anymore, esports definitely is." 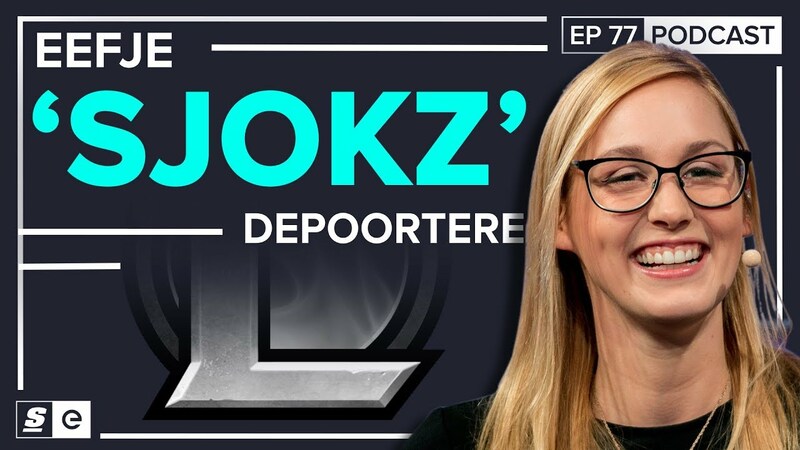 As for whether she'd ever consider moving to another esport, Sjokz said that, given esports broadcasting allows for such transitions in a way that traditional sports often doesn't, it's certainly a possibility. "Esports is a bit different [from sports,] in that it is definitely possible, but it is quite difficult because you are so ingrained in a scene and you know so much about the history, and that's not just something you pick up," she said. "But I do think it's possible." In terms of whether she'd ever go through with it, Sjokz said that even though she has no plans for the immediate future, it's definitely something she's considered. "I don't know what's in store for me," she said. "I do have to say that I've been doing this for seven years and only this, so sometimes I wonder 'Wow, what would it be like to do one of these other events?' Not right now but, I don't know. Why not?"